Isaac Newton is widely regarded as one of the greatest and most influential philosophers, mathematicians and physicists that the world has ever seen. He was born in 1642 in England; his father died before his birth and his mother left him with his maternal grandmother and remarried. These incidents had a marked effect on Newton’s personality as he was often under confident, nervous and belligerent and stayed unmarried throughout his life. He was first educated at The King’s School, Grantham and later at Trinity College, Cambridge, graduating in 1665 with a Bachelor’s degree. His uncle insisted on Newton’s further education, which was fortunate, because his mother desired him to be a farmer like his father had been. Newton was not an exceptionally brilliant student at school or college but he loved to enhance his knowledge of different subjects. He studied the works of all the philosophers such as Aristotle, Descartes and Galileo. During the course of his degree at Cambridge, the University was shut down for 18 months due to an outbreak of plague; in this time Newton conducted his research and laid down the principles of much of his later work in geometry, algebra and planetary motion. Much of this knowledge was further enhanced to form the “Principia” published in 1687. 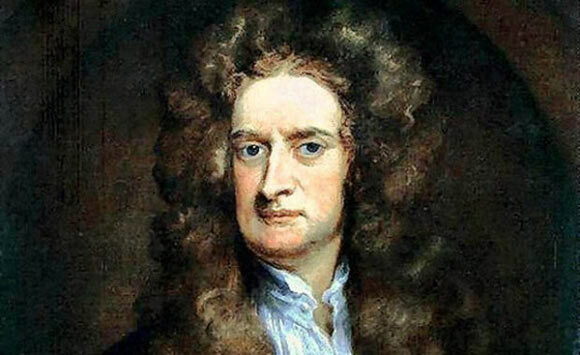 Newton was elected a junior fellow at Trinity College in 1667, and made a senior fellow in 1668. In 1669, he succeeded Isaac Barrow as the Lucasian Professor of Mathematics. He was elected to the Royal Society in 1672, where he presented his first paper on the nature of color. However, he was always at daggers with the society’s curator Robert Hooke, and this conflict would last until Hooke’s death. Hooke even accused Newton of plagiarizing his work, and although these charges were baseless, Newton withdrew his papers at the time. In 1678, he suffered an emotional breakdown which was preceded by his mother’s death. These events caused him to withdraw entirely from society and conduct his research in isolation. His most famous work, “Philosophiae, Natrualis, Principia Mathematica” or “Mathematical Principles of Natural Philosophy” was published in a series of volumes over a number of years beginning in 1687. It was widely acclaimed but here again, his intellectual rival Hooke accused him of plagiarizing and cast doubt upon his accomplishments. Newton was furious with Hooke – he even withdrew from the Royal Society until Hooke’s death in 1703 and withheld publication of some of his work because of Hooke’s hostility towards Newton’s publications. Newton was also widely involved in public affairs. In 1689 he was chosen to represent Cambridge in Parliament where he met the philosopher John Locke, as well as an exceptional mathematician named Nicolas Fatio de Duillier, with whom he became great friends. A few years later, however, he suffered another emotional breakdown but the exact reasons for it were unknown. After he recovered, he was appointed as the Master of the Mint, a position which gave him considerable wealth and power. After Robert Hooke’s death in 1703, Newton was made the President of The Royal Society, a position he held until his own death in 1727. He was an autocrat and rigidly dictated the society’s agenda without consultation with anyone. In 1705, he was knighted by Queen Anne of England which marked a shift from his scientific career to a political one. Issac Newton has influenced modern mathematics and science in a way that few can boast of. His famous Law of Gravity, for instance, published in the Principia, has forever changed the way we think. The idea originated in 1666, when he sat beneath an apple tree and pondered why the apple always fell vertically down towards the ground. Over the course of his career, he refined this principle into the Law of Gravity, one of the fundamental laws of physics today. Another example of the permanence of his influence is the three laws of motion he coined which are still universally accepted as basic laws of physics. He has forever changed the course of every field he ventured into, be it geometry, algebra, calculus, optics or mechanics. He died in 1727 at the age of 84, having achieved international acclaim during his life, and was buried in Westminster Abbey.